Good morning, chic readers! We hope all the mothers out there had a fabulous Mother’s Day. (We know we did!) If you’re in need of a little pick-me-up after all the festivities, look no further. While still maintaining the trappings of elevated style. Hampton’s good taste is evident in every room that bears her mark. It’s no wonder that she is frequently seen on Architectural Digest‘s AD100 and House Beautiful‘s Top Designer List. With a diverse range and flawless eye, it’s no wonder that Alexa Hampton is becoming a legend in her own time. From modern spaces infused with color to more neutral palettes that lend classic charm, interior designer Alexa Hampton tackles every space with grace and poise, elevating it to the next level. What’s your favorite Alexa Hampton space? Thanks so much for stopping by Design Chic today! We always love seeing you here! I always enjoy seeing Alexa Hampton’s designs. They are classic, timeless, sophisticated and simply put Gorgeous! Oh how I so love this post….love the super talented and exquisite Alex Hampton. I have pinned and pinned away….Such amazing inspiration here today….beyond amazing. I am in love with the white kitchen and the blue bedroom, both are perfection. Have a great week. I adore her style. 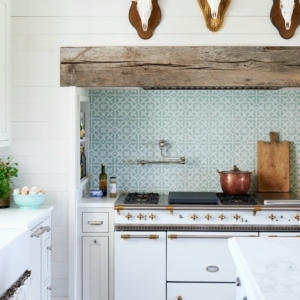 That white kitchen with the buffalo checks is one of my all time favorite kitchens! Glad you enjoyed your Mother’s Day!